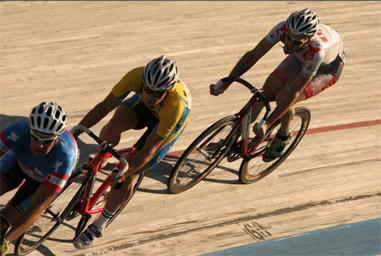 Thus starts my story in today’s Minneapolis Star Tribune, where I investigate track-bike racing at the NSC Velodrome in Blaine, Minn., a 250-meter oval of weathered afzelia wood. I’d never ridden a banked track before, but I clipped into my pedals after 15 minutes of verbal instruction, staying low on the track for the first few loops. The track was intimidating for the initial laps. When a rider passed me, he would be literally 10 to 15 feet above, body leaning a long way off-axis overhead. But in 20 minutes I was cruising, cranking as hard as I could consistently go around. The faster I went, the easier the velodrome rode. A blast! Here are a few images I took after trying my hand at the track. . . 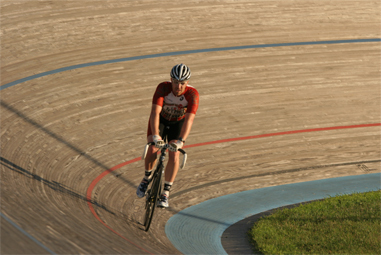 The velodrome’s banks are pitched at 43 degrees, which creates long, sweeping curves impossible to complete without speed. But velodrome competitors, called track-bike racers, employ inertia, speed and centrifugal force to stick to the off-kilter curves like little cars on a Hot Wheels track. 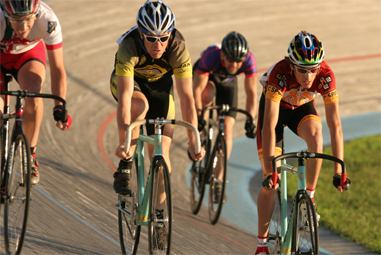 Interest in track-bike racing has accelerated in recent years, as stars such as Lance Armstrong draw more attention to competitive cycling and urban bike couriers and commuters popularize single-speed, fixed-gear bikes. 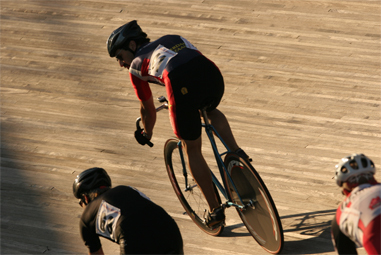 A good night brings 200 spectators to watch from bleachers above the track, eyes following the NASCAR-like action of a dozen or more riders in a pack, pedaling, swooping, passing, drafting wheel-to-wheel for a rest, then jockeying for position as the finish line nears. 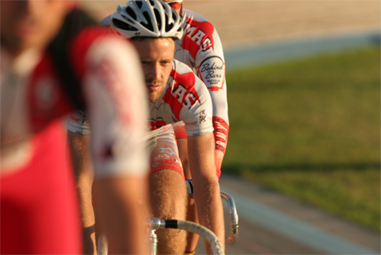 A typical race night at the NSC Velodrome sees about 60 riders competing in multiple events, some up to 80 laps long.